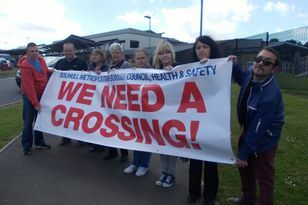 A PARADE of caravans that descended on Monkspath, before moving onto Knowle, have finally left the borough. As reported last week, the travellers moved onto land next to Lakeside Drive late on Monday evening. Council officials had issued a legal notice and warned that if the families didn’t leave the council-owned land, they would take out a court order. With the threat of court action looming, the families left the site on Thursday - but moved just a few miles away to Langfield Road, Knowle. Once again, council officers and police were on the scene to monitor the situation - but the caravans left less than 24 hours after they arrived. There were also reports of a separate encampment in Clopton Crescent, Chelmsley Wood, which has also been dispersed. A spokesman for Solihull Council said the travellers might have arrived for an event in Birmingham city centre. There were also been reports from residents in Monkspath that the families had come to the area for a wedding. Coun Alan Rebeiro (Con, Knowle) praised the council’s speedy response. But MEP Nikki Sinclaire was critical of the council for not treating the intrusion as a criminal offence. She said that doing so would have given police more powers to deal with the situation and might have deterred travellers in future. After the travellers left, Solihull Council dug trenches across the entrances.